A scene from ”Yarn: The Movie,” directed by Una Lorenzen. It is also a metaphor for the filmmaking process as Lorenzen weaves together various threads in her story. She includes the Christo-like public drapings of the Polish wool artist Olek, the huge, cartoon-colored, web-like sculptures of interactive textile creator and curator Toshiko Horiuchi MacAdam and the acute observations of award-winning, needle-wielding author Barbara Kingsolver. 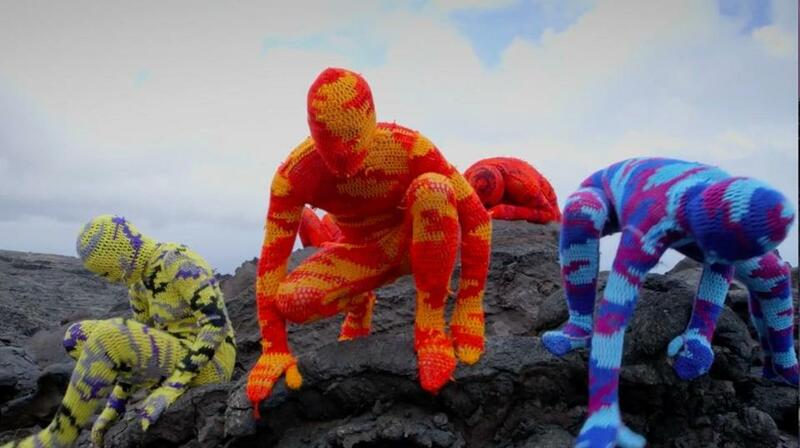 Her “Yarn” demonstrates that crocheting and knitting have gone beyond the homespun sampler stage to become the cutting edge in contemporary art and a new medium for women’s self-expression. “Yarn: The Movie” will screen Saturday at 1 p.m. at the Scandinavian Cultural Center in West Newton. For more information go to http://scandicenter.org/event/screening-yarn-the-movie. Targeted Regulation of Abortion Providers (TRAP) laws don’t exactly ban abortion. They just impose so many needless and expensive regulations on the clinics that in most cases they must shut down. Dawn Porter’s documentary “Trapped” shows how the impact of hundreds of such laws, passed since 2011 mostly in Southern states, have left their citizens without any providers. Told from the point of view of the workers and owners of beleaguered facilities, the film plays out in real time. A case before the US Supreme Court, Whole Women’s Health v. Hellerstedt, will decide whether these laws are constitutional. “Trapped” premieres on “Independent Lens,” Monday at 10 p.m. on PBS. For more information go to www.pbs.org/independentlens/. In the 1960s, the government and much of the media demonized the Black Panthers as violent radicals. Members of the organization, however, insisted that they only wanted to defend and develop their community. Decades after the movement was suppressed and obliterated, a former member still tries to fulfill the party’s self-proclaimed goals. Ryan Simon’s documentary “The Black Jacket” tells the story of Aquil Basheer, who teaches a 16-week course that bridges the gap between gang members in South Central Los Angeles and the outreach workers in hopes of ending the bloodshed. According to the film, the program has prevented hundreds of gang-related killings in LA and has been adopted by the LA City Council and other cities around the world. Like the community volunteers in Steve James’s documentary “The Interrupters” (2011), Basheer and his associates put their bodies and souls on the line to stem the attrition of urban violence. “The Black Jacket” is available Tuesday on DVD and Digital HD from Virgil Films. The slow rapprochement between the United States and Cuba may have started out as a cultural exchange. German auteur Wim Wenders’s 1999 Oscar-nominated documentary, “Buena Vista Social Club,” gave American audiences a taste of vintage Cuban music as it follows the title crew of ancient musicians — some in their 90s — who were forgotten after Castro’s revolution took over the island. Resurrected decades later largely through the efforts of blues guitarist Ry Cooder, the reunited Social Club resumes playing without missing a beat to perform in a triumphant world tour that climaxes at Carnegie Hall. The result is emotionally and musically irresistible. “Buena Vista Social Club” screens Monday at 7 p.m. at the Coolidge Corner Theatre. The program also includes Italian violinist Ludovica Burtone and Brazilian guitarist Leandro Pellegrino performing famous Cuban melodies. For more information go to www.coolidge.org/films/buena-vista-social-club. Though science fiction, the “Planet of the Apes” series of films demonstrates the spuriousness of elevating our species above the rest of nature and treating every other animal – including chimpanzees, who are genetically nearly our twins — as chattel. In their film “Unlocking the Cage,” legendary documentarians D.A. Pennebaker and Chris Hegedus take up the case of animal rights lawyer Steven Wise, whose Nonhuman Rights Project is filing lawsuits that seek to elevate the status of certain animals from a “thing” to a “person.” Backed by scientific evidence from primatologists and other scientists, Wise argues that apes, whales, dolphins, and elephants exhibit sufficient cognitive ability and emotional awareness to qualify for personhood. “Unlocking the Cage” screens June 26 at 2 p.m. at the Coolidge. There will be a post-screening Q&A with the filmmakers and Wise. For more information go to www.coolidge.org/films/unlocking-cage.